Tonight’s episode was one that left me wishing I could talk to someone who works for American Idol. Out of the thousands of people who tried out in L.A. (and online on Myspace, yes, MySpace) there was no one better, or at least more funnily-terrible than what we saw tonight? Maybe everyone good in Los Angeles is just waiting for X-Factor. Tynisha Roches brought her own microphone, hat, and square eyebrows and made the pretense of singing a tribute to Frank Sinatra, but it was clear that she didn’t know the words to anything she was singing. (I think she more didn’t care than didn’t know.) She chased Randy around the studio and finally got kicked out by security. Steven did make me laugh with the visual of Randy waking up in the middle of the night to see Tynisha standing above him with her microphone. Then we got to Matthew Scott Frankel, a guy who seemed like he shops at the Big But Not Tall clothing store. Matthew styles himself as a sort of Suge Knight, a white Suge Knight whose main asset is a homey in an orange t-shirt. After formally introducing himself, Matthew formally introduced himself again via rap. I really felt it from him, though, when he sang “Jenny From the Block” and got to the lines “Nothing phony, don't hate on me.” Randy did hate on him though, and Matthew declared that until further notice, they be beefin’, pending squashing of said beef. 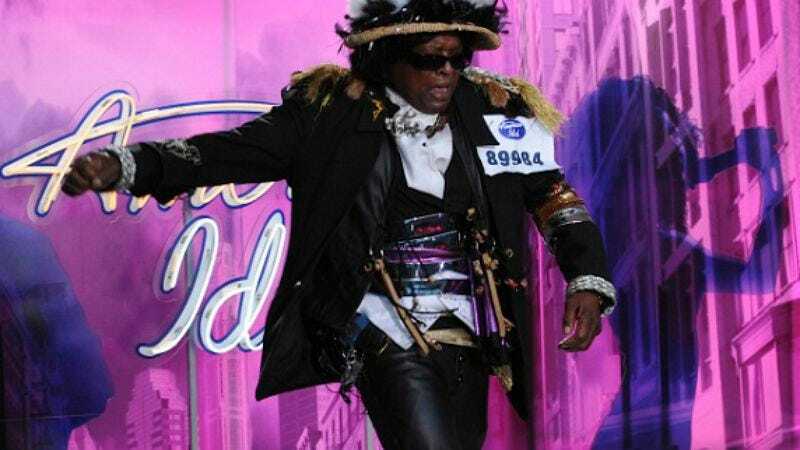 The last auditioner came from day one and it was one of those times on Idol where you think, “Am I racist if I laugh at this? Oh well, it doesn’t matter anyway since it’s not funny.” Cooper Robinson is 59, maybe, and comes from somewhere deep in Arkansas. He was dressed sort of like a New Orleans bandleader. He kind of sang “I Feel Good,” but he mostly jumped around and got out of breath and yelled. He wasn’t funny or charming or endearing or love-to-hate-y, and I hope we never see him again, but I worry he’ll reappear the last night of the season. I liked Steven’s Aerosmith shirt. Jennifer’s day two outfit, with the Grey Gardens headscarf and buttoned-up but translucent top, was inferior to day one’s. I wonder how much work went into the Myspace/Idol partnership, and how many auditions Idol producers had to go through, and whether we’ll see a single one of them this season, aside from Karen Rodriguez.